Jack Mitchell, 94, died peacefully at home on March 30, 2019. Jack was born in Prescott, Arizona to Betty and Harold Mitchell. He graduated from Shattuck Episcopal Military Academy in Faribault, MN. He earned a Mechanical Engineering degree from Indiana Tech. graduating in 1954. Jack’s hobbies included hiking with the Prescott Outing Club, where he met Edith, his wife of 30 years. He also enjoyed Cowboy Poetry and dabbled in writing his own Cowboy Poems. Other hobbies included skin diving and panning for gold. His pride and joy was his 1954 Mercedes-Benz 300SL Gullwing that he owned for 48 years. Jack will be forever remembered by his loving wife, Edith, stepchildren, Beth Dodaro (Chuck), Robert Booker (Leslie), Joan Wagner (Michael), Carolyn Kraft (Bob), and Ed Grey and Jack’s grandchildren. 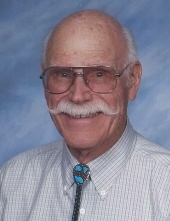 Visitation will be held from 5-7 PM, Thursday, April 4, 2019 at Ruffner-Wakelin Prescott Chapel located at 303 S. Cortez St. Prescott, AZ. Funeral Service will be held at 12:00 PM, Friday, April 5, 2019 at the Prescott United Methodist Church located at 505 W. Gurley St. Prescott, AZ. Interment will be at Mountain View Cemetery Prescott, AZ following the funeral service. Donations may be made in honor of Jack to the charity of your choosing, or flowers may be sent to Ruffner-Wakelin Prescott Chapel. To send flowers or a remembrance gift to the family of Jack Mitchell, please visit our Tribute Store. "Email Address" would like to share the life celebration of Jack Mitchell. Click on the "link" to go to share a favorite memory or leave a condolence message for the family.